That’s the motto of Wildness Collective, a writing group I’m a part of. We meet weekly and share our work, grouped around a common theme. Part of the intent is to push each other, to to go the places we normally avoid, to become better, more honest writers. Don’t fear the feels. 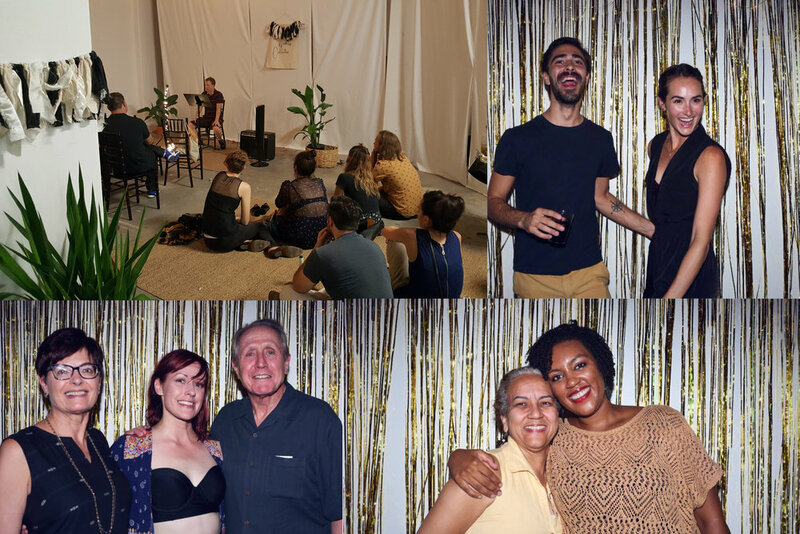 Our first reading was held recently, in the beautiful Show + Tell space, run by Mara Mehdy. Wild Gold, we called it. The Pretty Creatures ran the photobooth. Bringing people into our community was the goal. In the name of abundance, we went overboard with the beer, wine, popcorn and sparkles. We invited new people to read, welcomed curious wanderers off the Little Tokyo streets, and created beautiful banners with our motto: Share your wildness. Don’t fear the feels. Sarah Elaine White started with flowing poetry. Grace Duong followed with her charming children’s book. Shawn McClellan read an excerpt from his radical in-progress novel. Chelsea Naftelberg read two beautifully expressive pieces. Claire Finucane shared a short surrealist piece. I read my specialty, horror fiction. Follow our Instagram, where we post quotes from every reader each week.